First, a disclaimer. I am far from being an expert on the edible wild. That being said, this is an area I want to explore in coming years, partly because it has great potential in getting more people interested in nature. This is especially true right now, given the popularity of locally-sourced foods. The allure of the edible wild goes beyond the food itself. Heading out into the fields and woods in search of edible species is akin to hunting or even birding; there is great pleasure in simply searching. 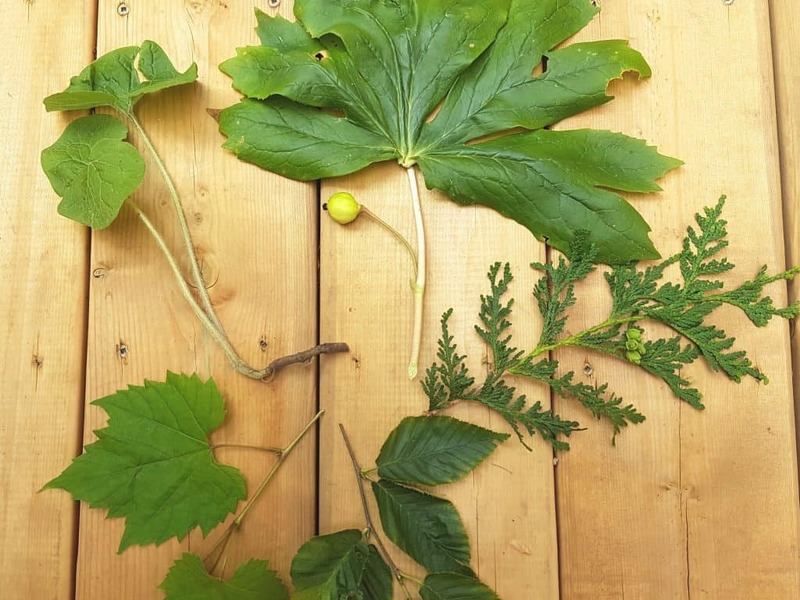 Also, who could pluck a ripe mayapple without becoming interested in the plant that produced it? How did First Nations use it? Does it have medicinal properties? Even if you don’t indulge in the food yourself, knowing which species are edible is yet another way to fix them in your memory and gives them a certain romantic glamour. Only take what you need. Remember, you must never impede a plant’s ability to thrive in the location where it is growing. Begin with just a small sample. It’s also fun to simply nibble on these foods when out for a hike. Never eat wild foods that may be exposed to pollutants or pesticides from busy roads or nearby farms. Only drink or eat a little bit at a time, especially if you are new to the species. Be sure of identification. I have included the scientific names, which will make an online search easier if you are not familiar with the species. “Spp” means there are different species in the genus. 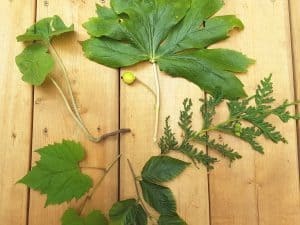 The list below is simply an overview of the many edible species in the Kawarthas. Thoreau once wrote: “It takes a savage or wild taste to appreciate a wild fruit.” That being said, many wild fruits have a delicacy of flavour that compete quite favorably with horticultural varieties. Mayapple (Podophyllum pelatum) Although mayapples appear in early spring with their umbrella-like leaves and hidden, single white flower, the apple-like fruit does not ripen until later summer. By that time, the rest of the plant is withering and the fruit has gone from green and hard to yellow and soft. The “apple” can be eaten raw but remove the rind and spit out the seeds. The taste is vaguely tropical. Serviceberry (Amelanchier spp.) Also known as Juneberry and Saskatoon, the red to purple-black fruits ripen in June and attract numerous birds. The berries can be enjoyed fresh, dried like raisins or even mashed to make jam. This has always been an important food plant to First Nations’ people across Canada. Riverbank or frost grape (Vitis riparia) This woody vine with maple-like, toothed, alternate leaves grows everywhere in the Kawarthas. The grapes are dark blue to black with a waxy coating. They are sweetest after the first frost and often still delicious in winter. They make excellent jellies and jams. Learn the difference between frost grape and moonseed, a poisonous species. The latter has leaves with smooth edges – not toothed – and the fruit’s single seed is crescent-shaped. Wild grapes have many seeds in each fruit. Raspberries and blackberries (Rubus spp.) Both of these plants can be common along roadsides and in thickets. Raspberries have numerous fine prickles on the stem, while blackberries have large, well-spaced spines. Wild rose (Rosa spp.) Wild roses have fragrant flowers that blossom from June to August. The fruits, which are known as rose hips, are red to purplish and shaped like a pear. They often remain on the prickly twigs well into winter and can be eaten raw. Be sure to spit out the seeds. Strawberries (Fragaria spp.) The tiny, sweet berries of this familiar plant are best enjoyed as something to gather and nibble on when walking a trail. They also make a delicious tea or cold beverage. Bruise the berries and let them steep in hot water. Drink hot or cold. Blueberries (Vaccinium spp.) Blueberries grow in abundance in dry, open areas such as granite outcrops with scattered white pine. The lowbush blueberry (V. angustifolium) is the most common species locally. The berries ripen in July and August and can be eaten fresh off the plant. Ground-cherry (Physalis heterophylla): While the rest of the plant is inedible, the orange fruit is a sweet-sour delight. It is held in a dry, papery husk. This uncommon native plant grows in fields and open woods. Common elderberry (Sambuscus canadensis): This common shrub of damp habitats has clusters of small, cream-coloured flowers. The purple berries ripen in mid-summer. Although inedible raw, the berries can be used for jams, pies and wine. Wild rice (Zizania spp.) Wild rice grows in large masses on the edges of lakes. The seeds are purplish when ripe in late summer. It was used extensively by eastern First Nations as a staple food and was abundant in the Kawarthas before the construction of the Trent-Severn Waterway. This nutritious food is planted and harvested in Pigeon Lake and can be purchased at the Peterborough Farmers Market. Ostrich fern (Matteucia struthiopteris): The coiled fronds (leaves) of young ferns are known as fiddleheads, because they resemble the scroll of a violin. Ostrich fern fiddleheads make for the best eating. Collect them in mid-spring when the plant is less than 15 cm high and the fronds are still tightly curled. Fiddleheads can be eaten raw or cooked for 10 minutes in butter. The taste is similar to asparagus. Watercress (Nasturtium officinale): This small, prostrate plant has opposite, oval-shaped leaves and a green tangled mass of shoots. It grows in shallow running water and is present year-round. In summer, watercress has small white flowers. It is one of our most nutritious wild foods. Watercress can be eaten raw in salads or as cooked green. Sarsaparilla (Aralia nudicaulis): Common around cottages on the Canadian Shield, “wild licorice” has three stalks, each with three or five leaves. A woody root runs on or just below the soil. The root can be eaten as a sweetish, licorice-flavoured snack. It is a main ingredient in traditional root beer. Cattail (Typha spp. ): The shoots, rhizomes, flower spikes and pollen of cattails are all edible. Eating the shoots is easiest. Grab a young shoot at its base and pull up until it breaks off. Peel off the outer layers. Wash well. They are delicious raw, steamed or stir-fried and taste somewhat like asparagus. Stopping to make a tea adds a fun element to hikes. Kids love building a fire! Eastern white cedar (Thuja occidentalis): Plays a few sprays of cedar leaves into water and bring to a gentle boil. Continue until the water is yellow to light green. Sweeten with honey or sugar to taste. Young spruce needles can also be used in the same manner. Cedar and spruce are rich in vitamin C.
Staghorn sumac (Rhus typhina): The densely-haired red fruits can be made into a refreshing rose-coloured drink with a lemony flavour. Crush them first and soak in cold water. Strain to remove hairs and debris. Sweeten with sugar and serve cold. The fruits are most flavourful in late summer or early fall. You can also chew and then spit out the fruit as a “trail nibble”. It leaves a pleasant taste in the mouth. 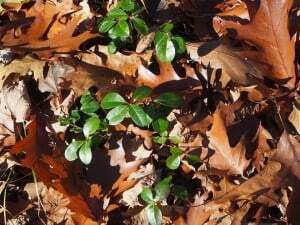 Wintergreen (Gaultheria procumbens): Also known as teaberry, this small, glossy-leaved plant creeps along the forest floor, usually under conifers. The leaves and berries have the spicy, aromatic flavour of wintergreen. Take a few young, tender leaves and steep in boiling water for a few minutes. Add sugar and even milk to taste. You can also chew the leaves and eat the red berries as you walk through the woods. Yellow birch (Betula alleghaniensis): Like Gaultheria, the twigs and leaves have the flavour of wintergreen. They can be chewed raw (and spit out) or steeped in boiling water to make a tea. Mint (Mentha sp. ): This herb has a four-sided stem, pinkish flowers and usually grows in moist areas. It has a strong mint smell. The leaves can be eaten raw or used to make iced mint tea. To do so, tear up a handful of leaves (to release more flavour) and place in a heat-safe bowl. Pour in boiling water and allow to steep for 10 minutes. Squeeze in some lemon juice and add sugar if desired. Wild ginger (Asarum canadense): This plant of rich woodlands smells and tastes like commercial ginger. The leaves can be made into fragrant tea, while the rootstalks can be used fresh, dried or ground as a spice. Others: Teas can also be made from the fragrant leaves of sweet-fern (Comptonia peregrina), wild bergamot (Monarda fistulosa), Labrador tea (Ledum groenlandicum) and sweet gale (Myrica gale) – among others! 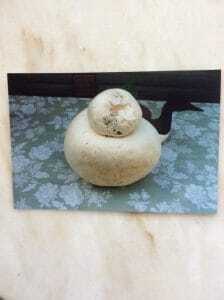 Giant puffball (Calvatia gigantea): Widespread and common, giant puffballs fruit in field and woods. They are often bigger than a loaf of bread and have smooth white skin. Cut the puffball in half and make sure the inside is uniformly white. Peel off the outer covering with a knife. Do not wash. Sauté thick slices in butter with onions. Other species such as gem-studded puffballs are safe to eat, as well. Just make sure they are all-white inside and have a uniform internal consistency. Edible & Medicinal Plants of Canada, published by Lone Pine (2014).